12 Stems of Mini-sized Lotus Pods on Stem. A native of Vietnam, Lotus plant are an aquatic perennial which form a distinctive circular seed pod that is as prized as the flower itself. Lotus pods are circular in shape, often with the lotus flower seed intact. 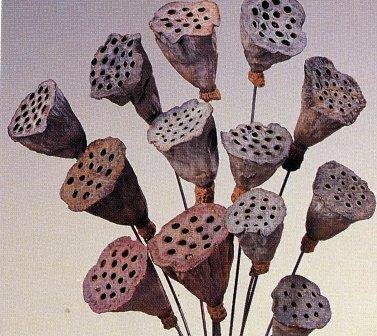 Lotus pods are truly an interesting decoration to add to any nature or floral display. 12 Stems of mini-sized lotus pods on stems. Lotus pods are circular in shape, often with intact flower seeds. Excellent decoration to add to any nature or floral display. If you have any questions about this product by Floral Supply, contact us by completing and submitting the form below. If you are looking for a specif part number, please include it with your message.